A visit in Istanbul is not complete without a cruise on the Bosphorus! This is a top level experience and it is the best way to appreciate the massive size and scale of 15-million- strong Istanbul, and a convenient way to see many of its outlying landmarks. In the week long Rick Steves Istanbul tour, we charter a private vessel to enjoy both banks of the Bosphorus in a pleasant pace. The vessel has ample space to spread out, between two decks, an in doors deck completely windowed an all sides and an out doors deck which is excellent to enjoy the breeze of the Bosphorus and taking wonderful photos. This cruise gives everyone a chance to sit, relax and watch a great city while listening to the narration of the guide. Sort of like a slow paced double-decker hop on hop off bus experience, without hopping off! about the Bosphorus at the officer’s deck! Istanbul are at the back drop. Bosphorus is a strait between the Black Sea and the Sea of Marmara. It is 19 miles long and curves like a snake as it connects the Black Sea in the north with the Sea of Marmara and eventually the Mediterannean in further south. Bosphorus is not a river, it is salty sea water. Steves Istanbul tour members enjoying the cruise. 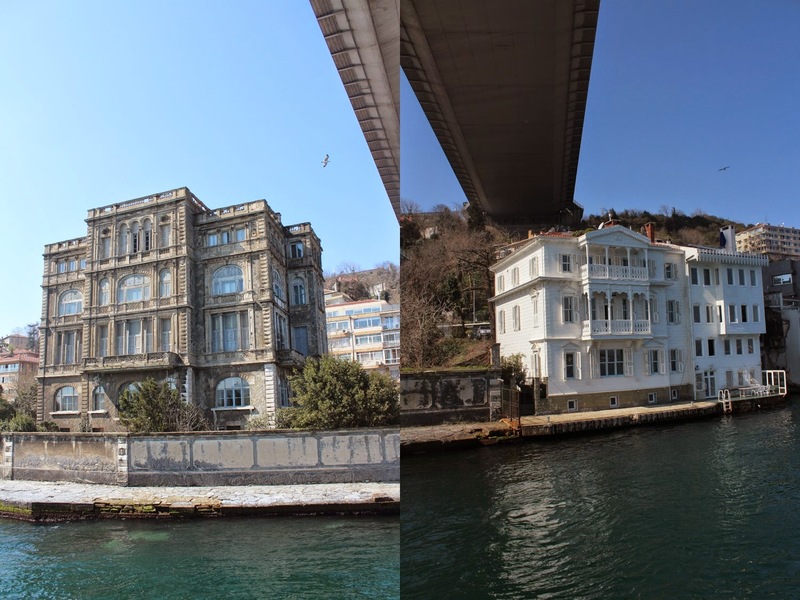 During a cruise on this strait, on the European shores you can see Ottoman imperial palaces, and water front mansions of the royal family members. On the Asian shores, you can see the mansions that were built by wealthy traders and high ranked officers of the government and the army. To generalize, we can say European shore was royal, and Asian shore was aristocratic. eclectic style Ottoman mosque from 1853. Istanbul’s various districts line up along the bays, and the coastline is peppered with cute neighborhoods. Many of these areas, once separate communities, have been incorporated into Istanbul as the town has sprawled every direction over the past several decades. Today Istanbul extends pretty much all the way upto the Black Sea. But a few neighborhoods in the north retain a village like quality, where men still fish for a living. is a small single floor structure with a single minaret. Bosphorus is not only a nice body of water for Istanbulites, it is a major highway for both public and international transportation. This was a factor why Constantine chose it as the new capital of the Roman Empire. On ferries buzzing between coasts of the Bosphorus over two million people commute each day. Navigation through the strait can be extremely difficult due to it’s narrow width (just over half a mile at the narrowest point), sharp turns, tricky currents, huge tankers and cruise ships that ply it’s waters. Powerful currents are mainly due to different salination levels of the Black Sea and the Sea of Marmara and Black Sea emptying into the Mediterranean. Clever ancient mariners figure this out; they lowered weighted baskets on lines down to the water to catch the lower current in order to pull their boats northward.